Two years of Google selling "Pixel" branded versions of HTC and LG handsets have done nothing to arrest the slide that both Android licensees are seeing in their mobile sales. Will more exclusive AI features on Pixel 3 models do anything to change that? After its initial work with HTC, Google moved on to partner with Samsung, then LG and Motorola. HTC’s next collaboration on Google's Nexus 9 tablet was a bust. Selected by Google to build the Pixel and Pixel 2, HTC's sales have slipped faster and faster down a slope towards oblivion. HTC reports revenues monthly, and the story they outline is dramatic failure. Across 2018, HTC’s revenues have increasingly plummeted. The seasonal boost last September didn’t occur this year at all, chalking up an 80 percent decrease in HTC’s revenues. Overall, HTC’s revenues in 2018 have collapsed by 57.72 percent. That’s in comparison to 2017, when HTC was already experiencing problems with selling its phones. Rather than helping, another generation of Pixel 2 ransacked HTC’s 9 months of revenues from 46,372 NT (nearly $1.5 billion) to a mere 19,507 NT ($600 million). Note that’s even before looking at HTC’s profits, which are a function of its volumes of sales. HTC revenues are circling the drain every faster, despite its Pixel partnership with Google. Google’s three generations of larger Pixel XL phones are built by LG. Those sales aren’t helping to stabilize things for LG, which has been actively losing money on its Mobile Communications operations. While the rest of LG’s consolidated operations are profitable, its MC group that builds Pixel XL as well as LG’s own handsets reported a year over year decline in revenues of 19.2 percent, and drop in operating income over twice as large: down 45.7 percent over the year-ago Q2. 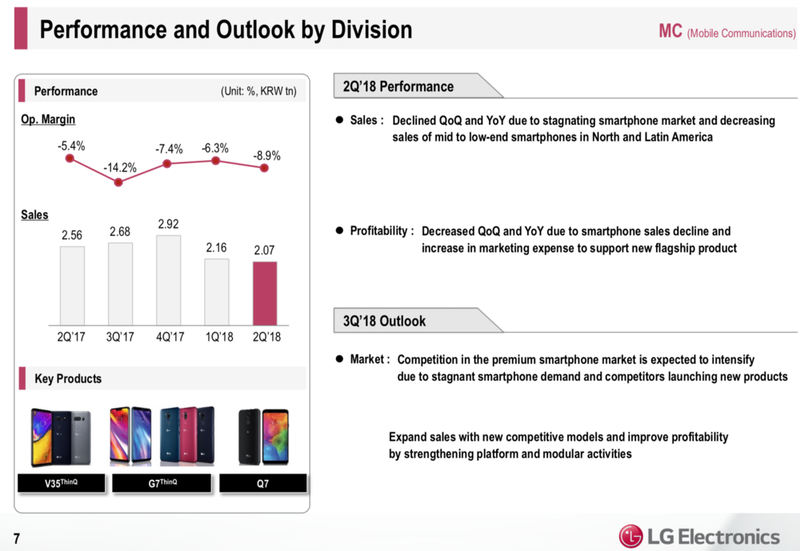 Looking ahead to Q3, during which Apple launched its new iPhone XS and XR models, LG noted, "competition in the premium smartphone market is expected to intensify due to stagnant smartphone demand and competitors launching new products." Google’s Nexus and Pixel rebrandings of Android licensee hardware were supposed to be a combination of a strategy to build a base of users dependent upon Google’s services and/or an object lesson for Android licensees to show them how to successfully build desirable, successful Android phones. By either metric, Google's Nexus and Pixel have failed disastrously over the last ten years. Why did the last two generations of Pixel phones perform so badly? Google pursued a software-first strategy that promoted exclusive, proprietary camera features that other Android phones didn't have. But there was little else offered to make Pixel competitive with other Androids that cost far less than Google was asking. And nothing about Pixel or Pixel 2 really offered anything to aggressively compete with last year's iPhone, let alone the newest iPhones Apple had released at the same time. In dramatic contrast to Apple's supply chain expertise, Google's Pixel is effectively helping to starve its own supply chain to death. Yet while sources from Bloomberg to the Wall Street Journal and Japan's Nikkei desperately search for potential problems among the often-false rumors surrounding Apple's tentacles of production, there's been nothing but glowing admiration for Google's wholly incompetent decade of ineffectual stabs at building a hardware business. There's not even any pointed criticism of Google's round-robin strategy of throwing resources at one Android licensee, then yanking support to work with another. When Apple switches suppliers, there's full, detailed coverage of the poor plight of the company that loses its business. Apple is even held to blame for App Store developers who can't find success. Yet nobody in Android land blames Google for the overall lack of commercial returns from Android. Among hardware partners, Android has been especially problematic. Google's devastating impact on HTC and LG is particularly notable because Pixel and Pixel 2 were supposed to be evidence that Google could produce an iPhone-priced, premium Android phone-- if only it could bypass the incompetence and foolishness of its bumbling, adware-infatuated Android licensees. Yet after Google took the reins, HTC and LG went from having problems to suffering full-blown crises. Google's supposedly stellar "brand value," its series of sycophant columnists installed at the Verge and elsewhere, and its tenacious grip on web advertising didn't help one iota to push a significant number of buyers to pay a premium for Pixel phones (or its Pixel-branded Android tablet, which ended up canceled entirely). This wasn't a unique event. Google previously destroyed any real hope for Nest by taking it over and seeking to align it with its true vision of Android. And before that, Google's takeover of Motorola-- once hailed as a genius deal on the level of chocolate and peanut butter-- turned out massive flops like Moto X, which not only failed to make money but actually incinerated $700 million across just the last six months of its production. Analysts and commentators who spent the first half of 2018 insisting that Apple’s $999 iPhone X was suffering from "disappointing" sales because of its premium price, a supposed "lack of innovation," and controversial design choices that included a camera "notch" are now telling us that Chinese companies that struggled to profit from high volumes of cheap phones will now successfully sell expensive models with an imitative notch.